Are you looking for details of superbike loans from banks? This article allows you to compare superbike loans of five banks in India through details provided of how to much of the superbike's price they finance, the eligibility criteria and the list of documents needed to be submitted when applying for the loan. Bikes are expensive; superbikes even more so. Consider the price of this year's Harley-Davidson Street 750 at your local franchise outlet: The starting price is Rs.5,25,000/-. The Suzuki Hayabusa's price in Delhi is Rs.13,59,000/-. 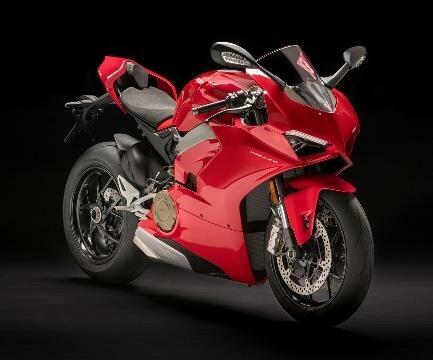 Higher up the price ladder is the Ducati Panigale V4 with the whopping price tag at Rs.20,53,000/-. Feeling faint? Yet, still want to own your dream superbike? State Bank of India offers bike loans for buying a new superbike having an engine capacity of 500cc or more. The margin is 15% of the ex-showroom price of the bike. The maximum repayment is up to 5 years. The processing fee: 2.00% of loan amount + GST with minimum Rs. 5400/- + GST and the maximum Rs. 17800/- + GST. The person in whose name the application is made should be at least 21 years of age. Applicants above the age of 65 years cannot apply for a superbike loan. A regular employee of the Central Govt. or a State Govt. or of a PSU, a private sector company, a corporation or a reputed establishment. A professional, self-employed individual, businessman, proprietor or partner of a firm and any other individual who is an income-tax assessee. An individual who is engaged in an agricultural activity or an allied activity. In this case, IT return is not required. For a salaried individual: The net annual income of the applicant and/or the co-applicant (if there is a co-applicant) should be together Rs. 6 lakhs and above. For self-employed persons, professionals, a proprietary/partnership firm & businessman: There should be a net profit or gross taxable income of Rs. 6 Lacs p.a. (income of a co-applicant can be taken together for self-employed, professionals and businessmen) as per ITR after adding back depreciation and deducting the repayment of all existing loans. For an agriculturist: The net annual income of applicant and/or co-applicant together should be Rs. 6 lakhs. The person borrowing (taking the loan) needs to submit a statement of his/her Bank account for the last 6 months. Additionally, he/she must provide a signature identification of himself/herself/guarantor (s) from the bankers. Two passport size photographs of the borrower/ the guarantor (s). A copy of the passport/voters ID card/PAN card. A valid proof of residence, such as tax receipts, a telephone bill, an electricity bill or any other document which complies with the regulatory and/or KYC requirements. A salaried person needs to submit the latest salary-slip showing all deductions and TDS certificate-Form 16. Professionals, self-employed and others need to submit a copy of Income Tax Return for last two financial years, duly acknowledged by ITO. Note that IT Return is not required in case of agriculturists. A non-salaried individual should submit a valid proof of official address. HDFC Bank not only offers up to 85% financial assistance to purchase a superbike, but also offers a finance scheme to purchase accessories up to Rs.2 lakh. A salaried or a self-employed individual can apply for this loan. The bank also arranges for service at your home for documentation requirements. The salary slips of the previous three months. Income Tax Returns of previous two years. A valid proof of residence. You can avail of 100% finance of on-road price of the superbike. Flexible repayment tenure is available with a low down-payment /EMI scheme which is appropriate for your specific financial requirement. If you are an existing customer of ICICI Bank, you can avail of a pre-approved loan. The processing fee is 1% of Loan amount or maximum Rs. 5000/-. The documentation charge is 2.25% of Loan amount or maximum of Rs 1000/-. For the purpose of KYC (Know Your Customer): ID proof, address proof, age proof and photographs. For Bank proof: Bank statement and signature verification from your Bank. For Income proof: Latest Salary Slip / Form 16. Other documentation: Proof of employment stability. For Income proof: Income Tax Returns of two previous financial years. Other documentation: Proof of having a stable business/ Proof of Ownership. You can apply for a flexible, quick & cost-effective way to own your dream two-wheeler, as captioned in the tagline of Axis Bank's loan scheme for superbikes. You can get up to 85% of the on road price of the Superbike and an additional 8 % on the accessories invoiced at the time of delivery. The tenure is a minimum of 12 months and a maximum of 48 months. Selected Axis Bank customers can avail of a preapproved offer. To be eligible for the superbike loan from Axis Bank, the applicant should be minimum 21 years of age and maximum 58 years. As age proof, the applicant can submit any of these documents: Passport, Driving Licence, Pan Card, Birth Certificate or any other valid proof. Additionally, the applicant should have been residing at the residential address as given in the application for at least one year. A working applicant should have been in employment for at least two years. A salaried individual needs to submit the following as Identity and Address Proofs: , Passport, Driving Licence, Voter's ID, Aadhar Card, Pan Card or any other valid document. For income proof, the latest Salary Slip along with the latest Form 16 has to be submitted. The latest 3 months Bank Statement also should be given. A self-employed individual needs to submit for age proof the same documents as for a salaried individual as mentioned above. The documents required to be submitted as office/business proof are: Telephone bill, Electricity bill, Shop & Establishment Act Certificate, SSI or MSME Registration Certificate, Sales Tax or VAT certificate and the current A/c Statement. Towards income proof, the latest ITR is required. You also need to submit the latest 3-months' Bank statement. You can avail of finance for superbikes from Yes Bank with up to 85% of the on road price of the bike, but only for select models. The maximum tenure is 60 months and minimum tenure is one year. The minimum loan amount offered is Rs.1 lakh and maximum Rs. 25 lakhs. KYC documents as per the bank's policy. Post approval: Loan agreement duly signed with RTO set. Post-dated cheques (PDCs)/ECS form/ Standing Instructions (SI) with security PDCs (as applicable). From information sources via forum discussions on the Net, it seems that nationalized banks are better sources for financing of superbike as it has been mentioned that the extra fees & charges levied by private banks tend to create a substantial hike in what you eventually pay out (refer www.team-bhp.com/forum). So it would be good to also look for loan schemes from Bank of India, Oriental Bank of Commerce, etc. If in doubt about any loan, you could seek advice from experts.